Packages are generally dispatched within 1 or 2 days after receipt of payment and are shipped via MRW or Postal National Mail with tracking and drop-off without signature. Also we offer the drop-off with signature in case of free delivery shipping. Whichever shipment choice you make, we will provide you a link to track your package online. 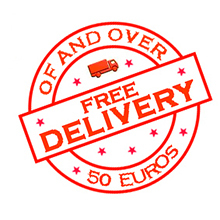 Enjoy our advantages of free delivery shipping on realized purchases greater than or equal to 50 Euros. In this case, all the items that you have selected, will be sent by registered post and totally free of charge !